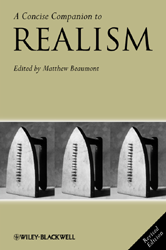 A Concise Companion to Realism offers an accessible introduction to realism as it has evolved since the 19th century. Though focused on literature and literary theory, the significance of technology and the visual arts is also addressed. Comprises newly-commissioned essays written by a distinguished group of contributors, including: Slavoj Zizek, Frederic Jameson and Terry Eagleton. Provides the historical, cultural, intellectual, and literary contexts necessary to understand developments in realism. Addresses the artistic mediums and technologies such as painting and film that have helped shape the way we perceive reality. Explores literary and pictorial sub-genres, such as naturalism and socialist realism.